With the success of The Gaslight Anthem's fourth studio album and major label debut, Handwritten, 2012 was a significant year for the band. Ahead of their visit to Australia, Killyourstereo.com caught up with guitarist Alex Rosamilia to discuss the tour, the success of Handwritten, and plans for writing a new record. How are you guys feeling about the upcoming Australian tour? I’m very excited, I love it there. It’s probably because it’s so far away from me, but I love it there. I think it’s awesome, it’s gorgeous. You guys are probably all jaded (laughs), but I love it there. The first time we had a chance to go there, which was July 2008, I couldn’t believe it when we got there. It was awesome. Then we got asked to go back. Every time I go I don’t expect to go back, so every time we get to go back I’m just as excited as the first time. You’ve been here a couple of times, but last time you were here was for Soundwave, which is a bit of a different vibe. Well, the first time we came over, we played some smaller venues. I think we were there for about a week and a half with our friend’s band A Death In The Family, who are from Melbourne. And we played with them in the States, so we went over and played with them in Australia. The shows were awesome, and like I said that was July 2008, so we have done a small club circuit, and then on some of those off days on Soundwave we played The Palace, I think with Social Distortion the last time, and then I can’t remember the other place. So we have played some of the bigger theatres in Australia as well, but I am excited to do a strict club tour again down there. There’s more time to kind of see everything. There’s a lot of flying in Soundwave. Did you get to see much while you were here? Yeah, I mean the first time we went we got to see a lot of stuff. Then the last time, we have a friend who lives in Sydney, and we had a day off and he took us around to some of the not-so-touristy spots. But I’ve got a picture in front of the Opera House and stuff too, so we try to get around. I personally try to get out as much as possible. You’ve got Dave Hause supporting which is really cool. How did that come about? Basically, everywhere we’ve toured so far, he’s opened up for us. He opened in Europe and the US, so we were trying to figure out who to open for the Australian part, and we kind of joked about a world tour, like in the 80s, it was like the same line-up the entire time. And we were joking about it with Dave and we were like, "Well, why don’t we just actually do it?" (laughs) So yeah, that’s how Dave got to open the Australian tour. I’m really stoked, I just love watching him play, he’s really good. Yeah, he is really good. Do you often get to choose who comes on the road with you? Yeah, for sure. I mean, we try to get as involved as possible, to the point where we’re even picking bands that maybe our booking agent isn’t stoked to have (laughs), because they don’t draw so much, but bands that we find to be interesting and that we like, or a band that we happen to be friends with. But yeah, we always take a part in who we play with. Like a lot of bands, you guys seem to be on tour all the time. Do you have much time to think about where you’re headed next or are you just kind of focused on where you are at the moment? It’s all in the phone so I don’t need to worry about it (laughs). My manager updates things and then my phone buzzes at me and tells me where I need to be and what I need to do. I try not to worry about it, I just try to take it in, where I am and what I’m doing at that point. 2012 was a pretty huge year for the band, with the success of Handwritten and everything. Were there any standout moments for you personally? Just the size of the shows getting bigger. It’s hard to take in when you’re doing it, and then you get home for a couple of weeks and it all kind of hits you at once. I just think the whole touring on the last record has definitely been a step up from where we were, and I don’t want to say it legitimises us as a band, but I mean, we’ll be here for a bit now. And I’m obviously really stoked that. I feel like we’ve kind of made a niche into the huge timeline of rock ‘n’ roll. I’d like to say we’ve made some sort of mark in there, and I think it was with this last record. So you said when you get home for a couple of weeks, you have time to reflect on it. When was that for you? Through Christmas and the holidays and stuff, we hung out with family, and they kind of tell you all this stuff you did, and you think, "Oh yeah, I did do that. Oh yeah, I did that too." Like when you’re doing it, you don’t have time to focus on the size of what you’re doing until after you get done with it, and then you have time to sit down and take it in. 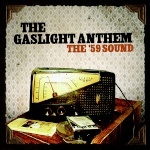 I know that before Handwritten, I had never heard a Gaslight Anthem song on commercial radio in Australia. That’s the same for us, that’s all over the world. ‘45’ is what got us on the radio. I mean, we were played on satellite radio a bit, but that got us on BBC 1 in the UK. I mean, that’s like moms doing the dishes in the middle of the afternoon, listening to ‘45’ (laughs). At the stage we were at that time, you’re trying to find out who wants to really do it and who really wants to play. Because the idea of touring and touring on no money, it really does work for some people. I don’t think anybody likes being broke, but some people sit through it and do it because they like touring so much and playing shows to 20 kids at a time, and that’s what it’s all about. Some kids don’t like doing that. You play with kids and they go on tour and they’re like, "Oh, this isn’t for me," and then the band breaks up, so then you and one other guy start a band with somebody else and that’s kind of what happened to all of us up until that point. By me replacing the guitar player that was already there, they kind of had to change the name to The Gaslight Anthem, because there was nobody in the band who was in This Charming Man anymore, which was the name of the band prior. You know, it’s that kind of idea, but that happens with every band. It’s a lot easier to start over again when you’re 21, and at that point we were all – it doesn’t seem old now, but god, I felt like I was old then – like 25, 26, you don’t want to have to start all over again. So we all decided that this would be the last time that any of us would really push for it, and I think that really helped us get to where we are, because it meant we were all pushing for it as hard as we possibly could. You’ve achieved a lot in a relatively short amount of time. Do you have any goals for the band at this point? I want to be able to continue what we’re doing now, and I want to be able to play music with my friends for as long as I can. That’s really all. And if we don’t make money doing it anymore, that doesn’t mean I want to stop doing it. I’ll never stop playing. Brian mentioned that he’s planning on releasing a solo record this year, but also writing new material with Gaslight. Where are you guys at with that? Right now we’re just practicing what we do have because we’re on tour again. I can’t say for sure, but I can almost guarantee we’ll have one or two songs done in the next couple of months, by the end of the touring cycle probably five or six. When we’re done touring, we’re going to have to write a new record, that’s the way the cycle works. That’s what we’re writing for, but we’re not really going to hone in on it until we’re done touring for this one. You don’t want to get too far ahead of yourself. Do you have separate projects outside of The Gaslight Anthem? Yeah, I’m always doing something. Ben and myself have a side project with two of our friends that’s more of an avant-garde, kind of heavier thing, and me and Ben have another thing that we do that’s more... I guess it sounds like Black Sabbath, but faster, kind of an air of Red Fang or something like that, with my cousin. I’m always doing something. We practice in a recording studio, so today when they went home, I recorded guitars for this metal thing I’m doing with my cousin and my friend. The three of us also scored a movie that Benny wrote and directed with our friend Kevin recently. It’s like a disease, I can’t stop it, I’m constantly writing. If I’m watching TV, I have a guitar in my hand, it’s like it keeps my mind quiet. I’m always doing something. Everyone mentions Bruce Springsteen and a few others in relation to The Gaslight Anthem, but I imagine there are other influences that people kind of gloss over. Yeah, oh yeah, there’s a bunch. As far as Benny’s concerned, I would say Zeppelin is a pretty big influence. Things like The Clash. Personally for myself, I’m huge on things like The Cure and The Smiths, that kind of stuff. I mean, it is a lot of different stuff, but because Brian’s the one singing, I think people just have to compare it to something else, that’s the only way to explain it. And I can see where you could make comparisons, but I wouldn’t say it’s his main pool of influence. It’s not like it’s time to write a new record and he puts on Born To Run, that definitely doesn’t happen. He definitely does it, but he does it to a bunch of different stuff, not just The Boss. I think when you notice it, you can hear it in different songs, things like Tom Waits and Eddie Vedder. Well, that pretty much wraps it up for me. From what I know you’re on tour for the next few months, do you know what your other plans are?